Now that we are finally able to control the water on-site, it was time to exhale and proceed with the next steps. 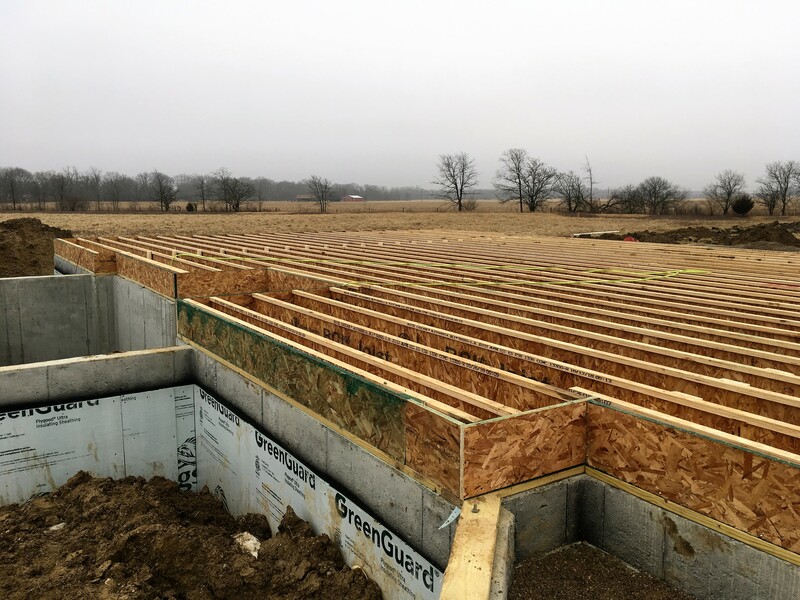 Within the next two-week period, the rough-in plumbing will be installed in the basement, the outside of the walls will be water-proofed, gravel will be installed over the perimeter drain tile, and the basement floor will be poured. While it won’t look like much is taking place for anyone driving by, these steps are still extremely important. As I mentioned in an earlier post, we had the drafter plan a finished basement for us even though we won’t be finishing it for quite some time. The purpose of this was so the support walls could be utilized vs. the metal poles and laminated/steel beams. We also did this so the rough-in plumbing would be in the correct areas. Many times I’ve shown houses with unfinished basements and the location of the rough-in plumbing is perplexing. 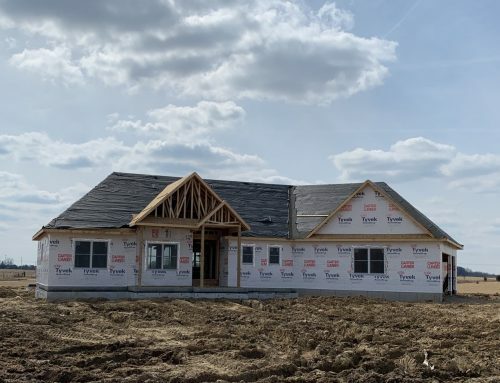 In one situation, the rough-in plumbing was so close to the mechanicals (HVAC, water heater, water softener) that you couldn’t even get a hallway in between the two to access the other portion of the basement. With our plans, we were confident that the plumbing would be in the correct location for our future bathroom and wet bar. 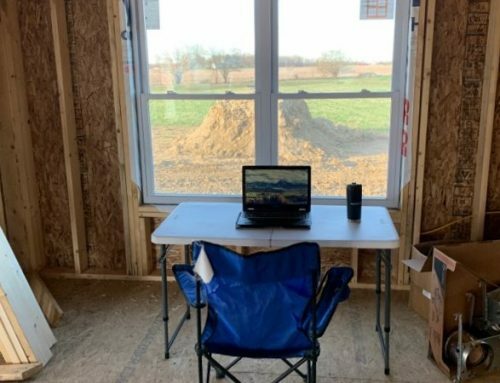 Prior to the arrival of the plumbers, Keith set up his laser transom to shoot grade on the gravel that had previously been shot into the basement prior to pouring the basement walls. He went around the entire basement knocking down the high spots and filling in the low ones. As he was finishing this process, the plumbers arrived on site. During the next several hours they installed all plumbing and drainage that would be under the basement slab. This included only the drain lines as the supply lines would all be dropped in from the ceiling down. 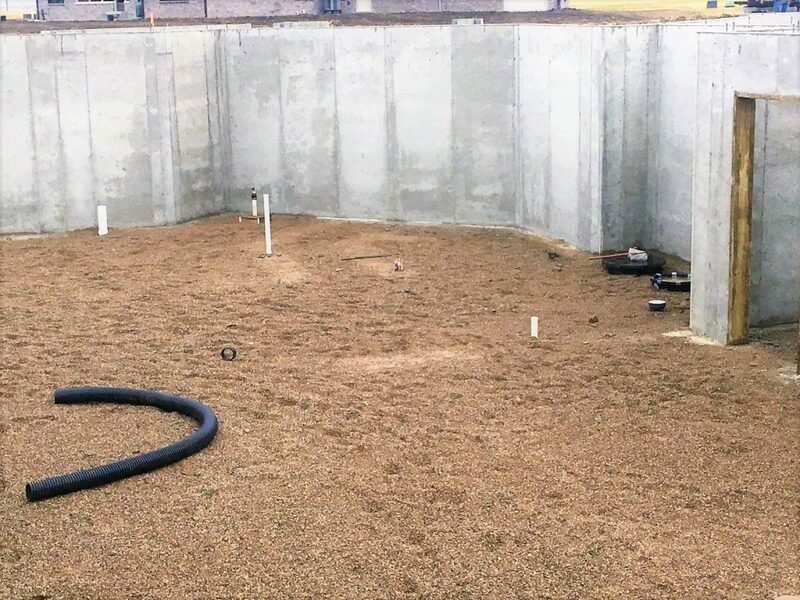 First, they set the sump pit that would serve as a back-up to our external reservoir tank. The concrete company was originally supposed to set this, but plans had changed for various reasons. In order to set the pit, they had to level the top of the pit with where the top of the basement floor would be (4” from the top of the footer). They then tied in the drainage tile that was installed on the inside of the footers. Water will always remain in the bottom of this tank up to the bottom of the drainage tile, but will never get any higher as long as the pump in the reservoir is functioning properly. Next, they installed the grinder/ejector pit into which all of the basement drain lines will be tied. Once we finish the basement, a grinder pump will be installed in the pit that will lift all of the black water up to the main drain lines. Then, they worked to install the drain lines for the toilet, shower, bathroom sink drain, and the wet bar sink drain. The drain lines were all capped at their locations and where they entered the grinder pit. On top of the shower drain, the plumber had to install a valve and pressure gauge where he could hook up an air compressor. When finished, he pumped 5 pounds of pressure into the drain lines. This was a requirement so that the building inspector can make sure sure that all drain lines are sealed appropriately. Finally, they installed two floor drains. One floor drain was installed in the room that will be under the front porch. This drain will be used if we want to use a dehumidifier and allow it to empty directly into the drain. The other drain was installed in the area of the HVAC unit and water heater. These drains were able to be tied into the perimeter tile as it will be “clean water.” With these steps complete, I won’t see the plumbers back on site until the framing is complete and the house is enclosed. 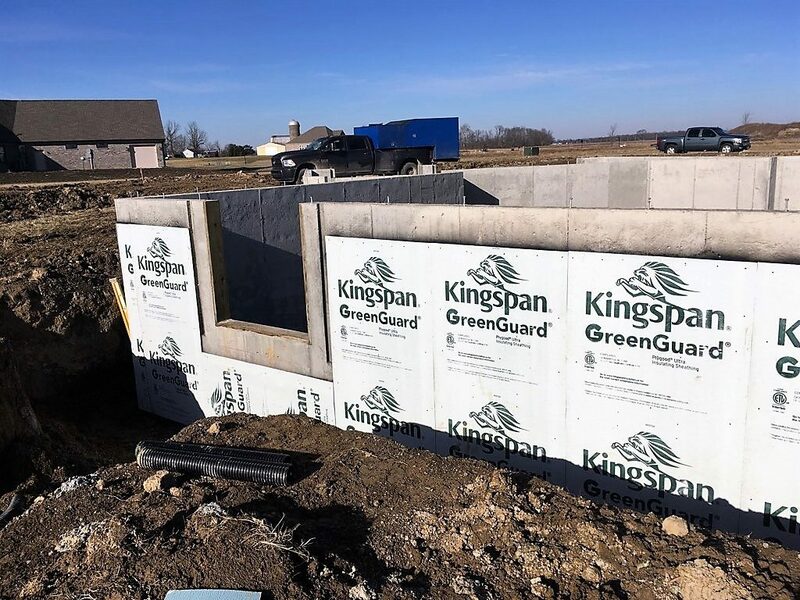 The last item for the concrete company to complete (other than fixing my jacked-up window openings) was to water-proof the outside of the basement walls. 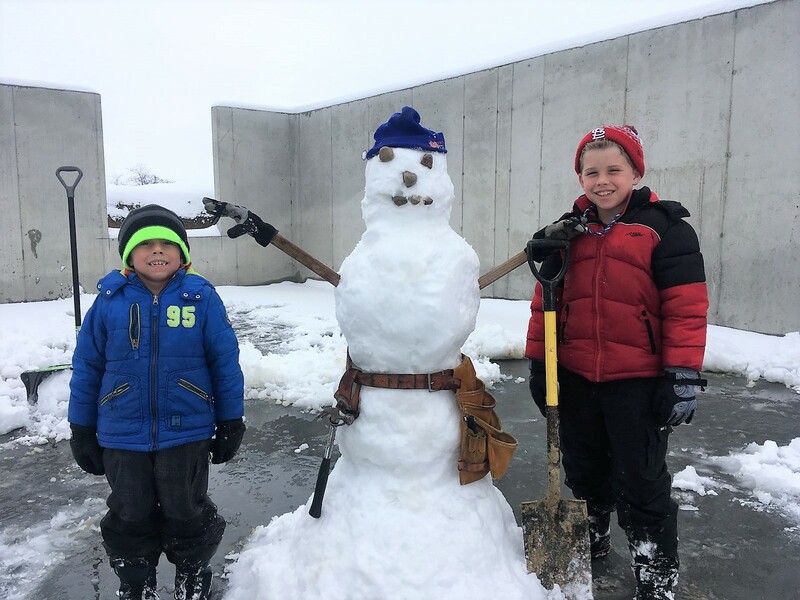 In order for them to complete this task, the top of the footer had to be cleaned off. 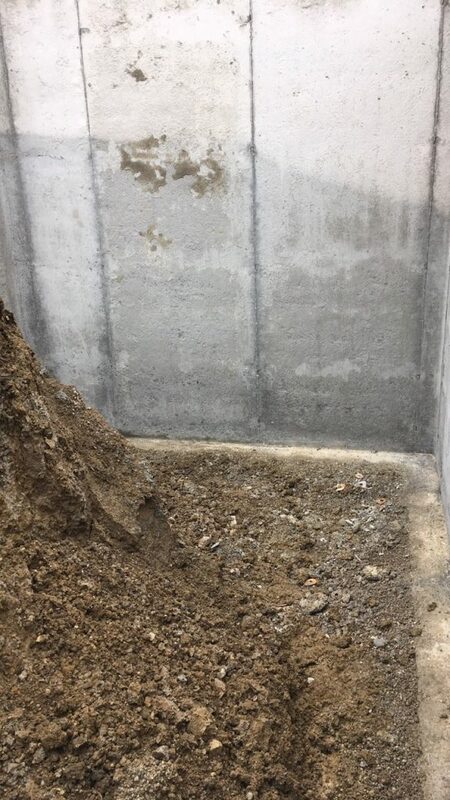 Since there had been several workers on the outside of the basement walls when they were taking down the forms, a lot of dirt had caved in on top of the footers and the pea gravel. This dirt had to be cleaned off as they would be spraying the tar substance on the walls and on the top of the footer. 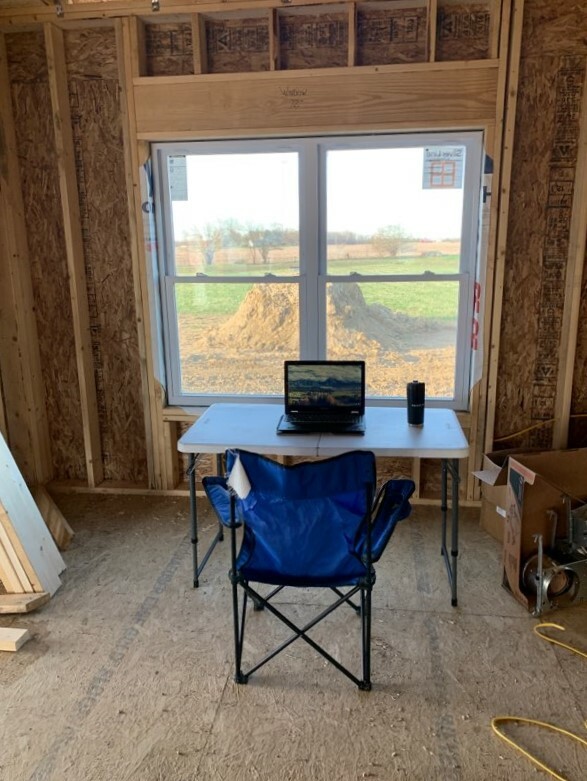 I didn’t want to give the concrete company any excuse to add an additional expense to my final bill so I decided to go out and operate a shovel for a few hours. I thought this was going to be a relatively quick and easy job; however, this was far from the case. Once I started shoveling, I didn’t realize how much mud and muck had been mashed into the top of the pea gravel. This had to be removed for the later installation of gravel so I decided to take care of it all at once. Shoveling the dirt off the top of the footer was easy with a square-end shovel. It was shoveling the muck off the top of the pea gravel that was the challenge. The dirt was so wet that it stuck to the shovel, which sucked especially when I was trying to through it up and over my head. The other challenge was the fact that I had muck all over my boots that picked up a ton of pea gravel with every step. After several choice words and breaks to catch my breath, I finished the task two and a half hours later. Four inches of footer cleaned off and dirt/mud shoveled off of pea gravel. The water-proofing crew showed up a couple days later to complete the task. Dressed in their head-to-toe white suits and face masks, they started the application of spraying the tar-like substance on the exterior of the basement walls. The air temperature had to be in the upper-thirties or above or else the material would not spray out of their spray gun. This process only took them about 3 hours to complete. Next they installed insulation board on top of the seal-coated walls. This process consisted of the workers placing 1/2” thick insulation board on the wall vertically and fastening them with concrete nails. At this point, our family left for a post-Christmas vacation to the Sunshine State. I had requested that Keith keep me in the loop with what was going on and send me some pictures along the way. His first update was that he had completed the gravel-backfill process over the perimeter drainage tile. To do this, he used his bobcat to dump two feet of gravel along the outside of the exterior basement walls. This gravel will allow any water that enters from the soil to easily find it’s way to the drainage tile below that will then flow into the reservoir pit. Once all of the gravel was placed, Keith installed a fabric on top of the soil. 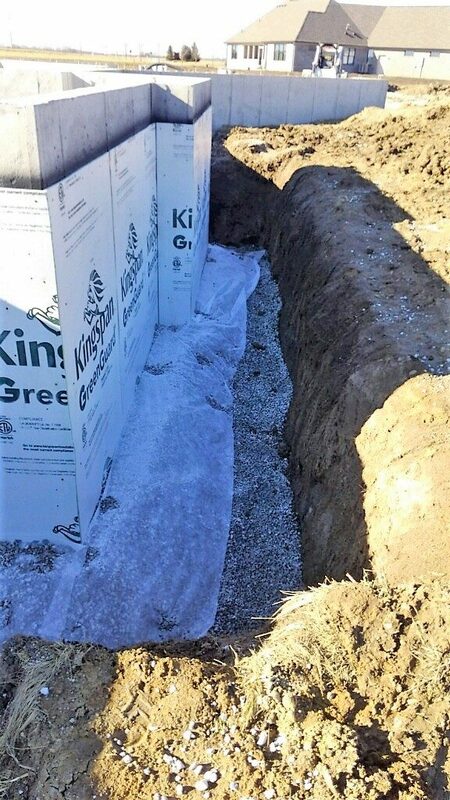 The fabric will keep any dirt for compacting on/in the gravel which would prevent the water from flowing down to the drainage tile. After watching the weather and checking with his contractor that pours his flat-work (floors, porches, driveways, etc. 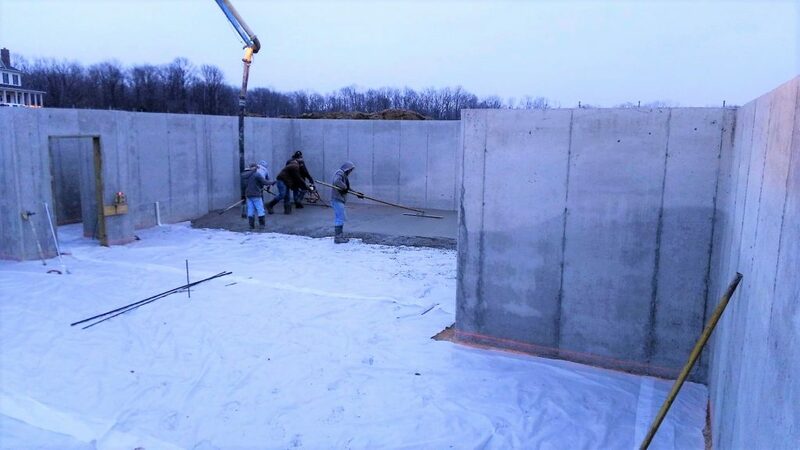 ), Keith scheduled the pouring of the basement floor for a Thursday. Keith arrived early Thursday morning to do some preliminary work. 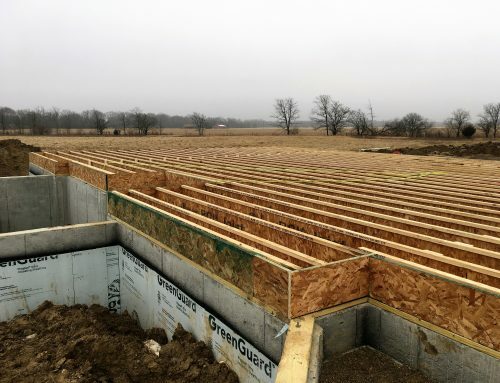 He had to put down a plastic vapor barrier that covered the basement gravel and would prevent any moisture from coming up through the slab over time. 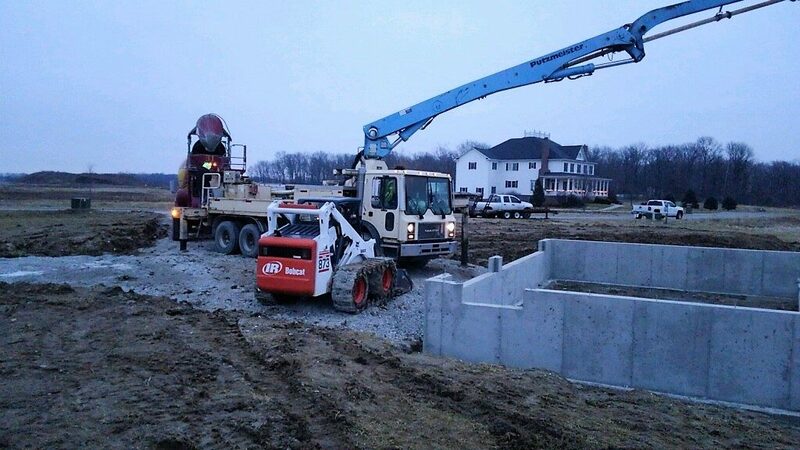 While completing this process, the concrete contractor arrived and started getting his equipment ready for pouring. He had to set up a laser that shot a line around the perimeter of the basement 4” above the footer. This would allow him to keep a consistent thickness of concrete throughout. 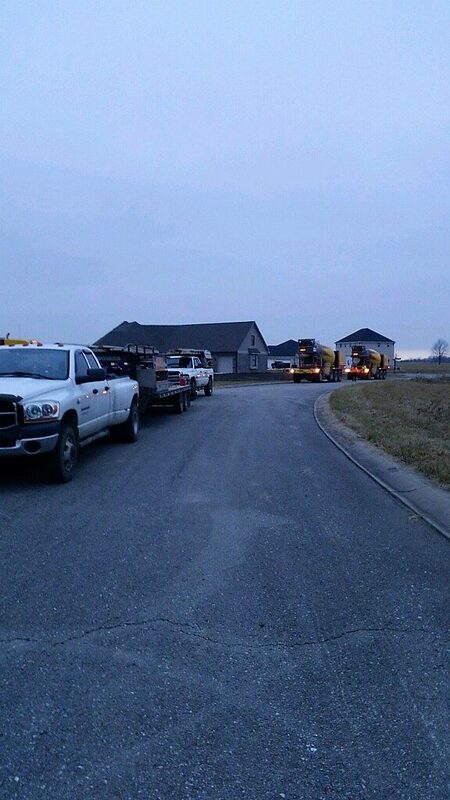 At the same time, the concrete pumper truck arrived and got situated in the driveway. Everything was falling into place as the concrete trucks started arriving. Due to the time of year (winter pour), the concrete in the trucks were mixed with hot water and calcium so it would set up/cure more quickly. 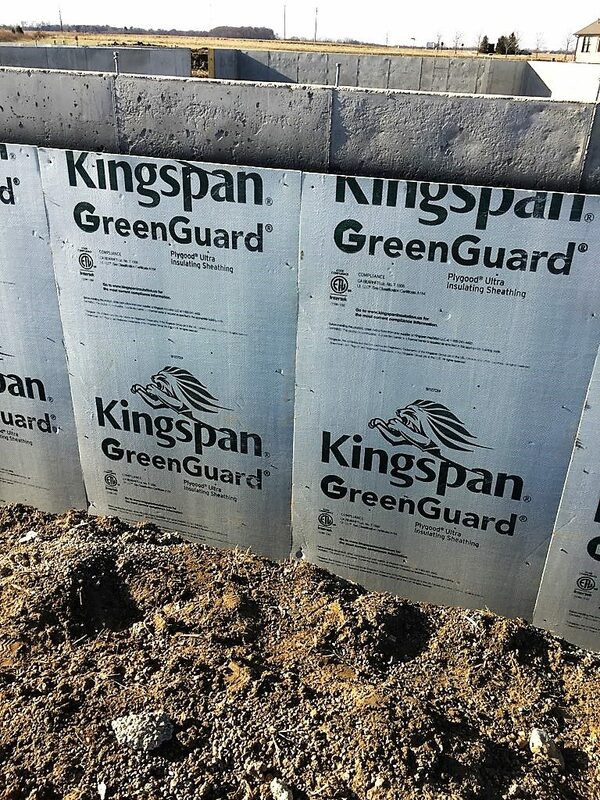 These were the same additives as with the basement walls and footers. Concrete pumping truck getting set up in the driveway. 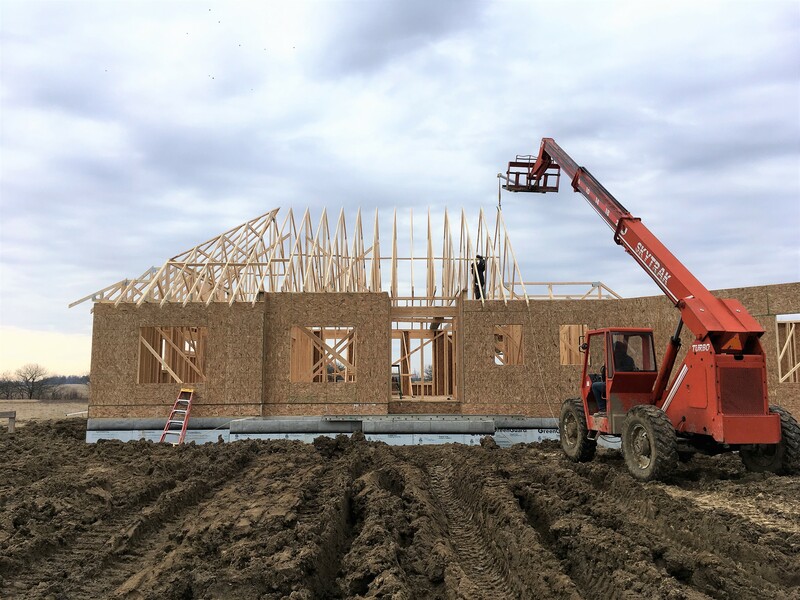 The crew started on the east end of the basement and worked their way across the entire area. One worker was guiding the shoot from the pumper truck back and forth to spread the concrete. Three other workers were pushing and leveling the concrete while another was using a laser to check for the appropriate grade/thickness. The operator of the pumper truck was also down with the concrete crew using his remote control to guide the shoot and control the flow of concrete. The white plastic is the vapor barrier that is installed between the gravel and concrete slab. The laser is mounted by the doorway on the left allowed the workers to check the thickness of the concrete. Throughout the process, the crew also installed a thin, black plastic material for control joints. A large area of concrete will always crack over time. These pieces ensured that the cracks would be straight and barely noticeable versus jagged “spider cracks” at random places throughout the floor. 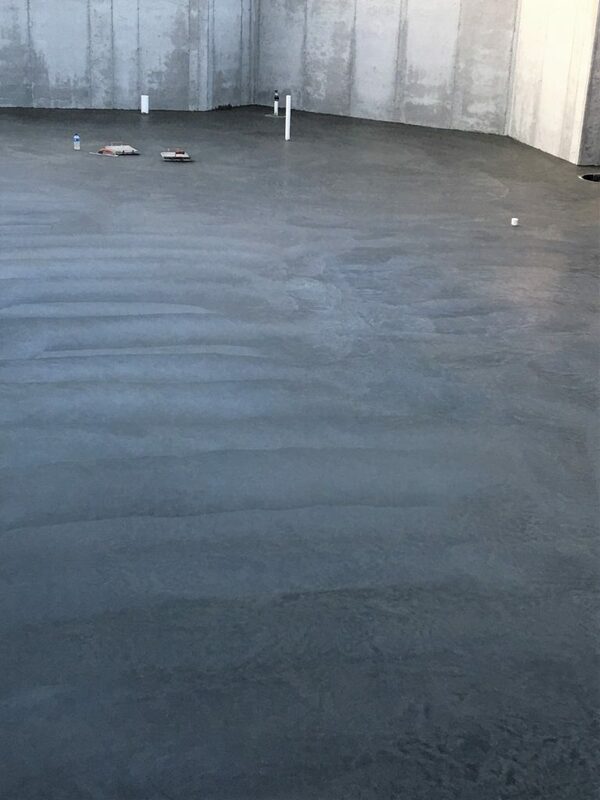 As the concrete set up throughout the day, the crew also used their finishing tools to give the concrete floor a perfectly smooth finish. 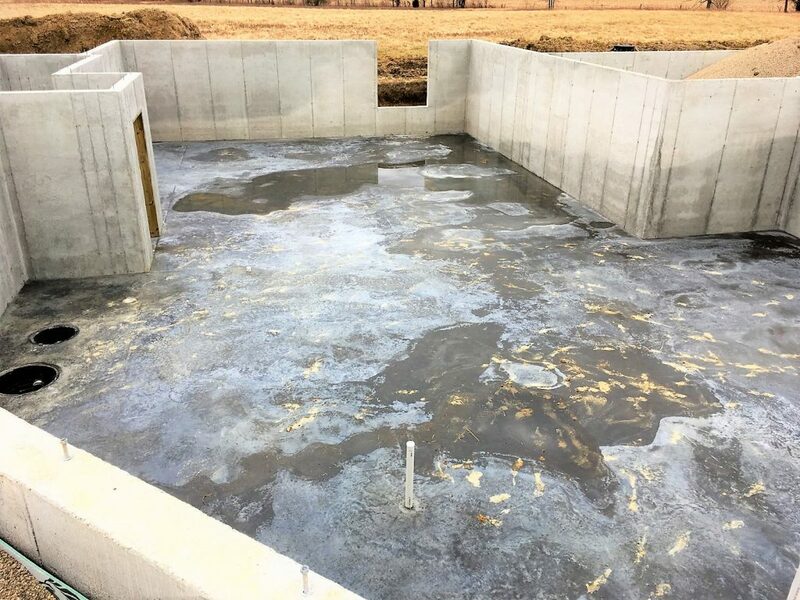 The process of pouring the floor took the entire day to complete. 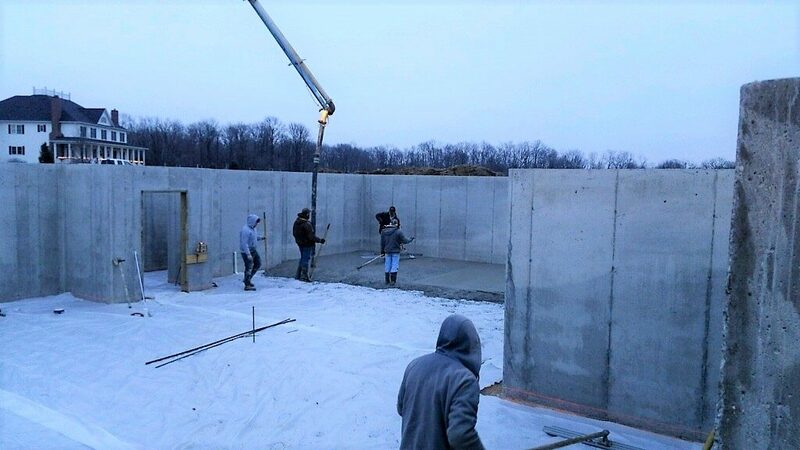 Luckily, the temperature would not be dropping below freezing for the next several days so it was not necessary for them to cover the whole slab with thermal blankets as it would cure appropriately without. Once completed, the concrete crew cleaned up their tools and were on their way. 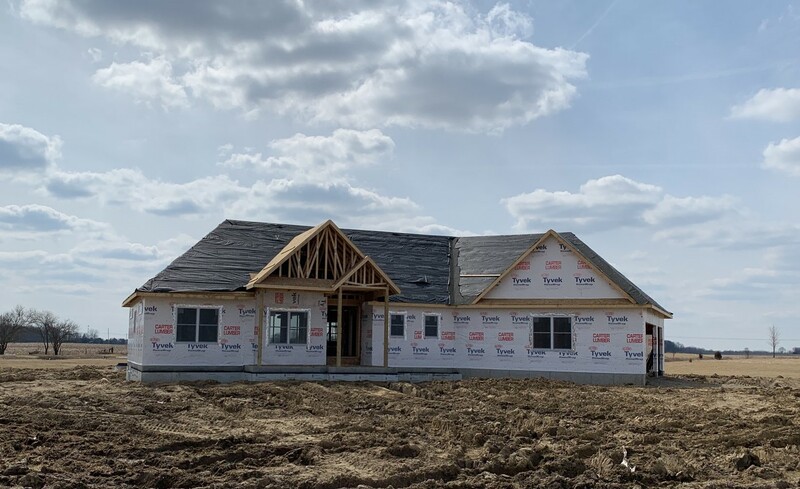 They will be back in warmer weather to pour the garage floor, porch floors, sidewalks, and driveway. Floor as the crew was finishing. Thanks Billy and Jenny Cooper for some pics! Picture of the floor from above after Caleb and Harrison checked it out with their muddy boots.